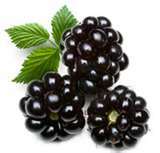 Returning to my theme of expanding my vegetable and fruit choices each month, July is blackberry month. Not cooked, not frozen - just blackberries as nature intended them. They are juicer than blueberries, more plump than raspberries and contain a huge amount of nutrients and all that good stuff we are supposed to eat daily. Right now the price is right on blackberries. I bought a pint tray for $3.89 yesterday and had them with fat free Greek yogurt. It was a nice change from the blueberries I eat five out of seven days a week. There will be no making them into pies and tarts. They will not be cooked down into a sauce. I have no plans to freeze them into a sorbet. They do not need sugar or Splenda or any of that other sweetening stuff filling the store shelves. With blackberries, I do not believe I can improve on Nature's creation. By the way: If there is anyone who lives out west who can send me some fresh boysenberries, please let me know. I prefer raspberries to blackberries...I also love a good peach, but they are so hit or miss. I hate biting into a mushy, mealy peach! Just found your blog. Perfect timing. KCLA- This year's peaches have been the most disappointing. I even had trouble finding a decent peach in Georgia! ElleC - Tell us about Sonnet cherries. What makes them special to you (besides availability). They are quite large, at least twice the size of a Bing cherry, they are crisp, not mushy, and they have a very small pit. They taste like heaven. The orchard starts picking Friday or Saturday. I am getting geared up for them, I am going to pig out this weekend. We also have good peaches here, but not for another month or so. I have the Rainier in the house right now. I was listening to Doctor radio (as I usually do: yes, I am a freak). They were discussing tart cherries. Not sweet cherries that are tart but cherries that are grown tart. They seem to have strong anti-inflammatory properties but are so tart you do not eat them straight. They were talking about juicing them. Anyone got the lowdown on TART cherries? Yes. Tart or sour cherries are the also known as pie cherries, because they are the kind of cherries used for classic cherry pie. I just wrote a post on my blog (sewing blog, btw) about making sour cherry jelly. What you heard is right, they are not good for eating. I have had dried ones though and they were good. I also found this article about sour cherries. Yummy, I love blackberries! I haven't seen them at my grocery store or farmer's market yet...but if you have them hopefully they'll show up here soon. Not a lot of difference in the numbers. I had never actually compared numbers until I read this post. I have been eating dark tart cherries for years. I buy from a restaurant/cattering type store that also sells to public. These are frozen. I also buy frozen blueberries from them. Flash frozen, nothing added. Tart cherries are for cherry pie - where they are drenched in so much sugar it will put me in a coma - and I am not diabetic. I guess I will stay away for now.